A fishing port in Southern Brittany provides the backdrop for this painting. 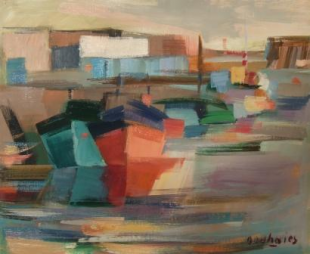 Based on a familiar theme of harbours and seascapes, Deshaies explores the shapes and colours of the fishing fleet at rest. Having studied fine art at the Ecole Beaux Arts in Paris, Rouen and Caen; Deshaies has been a renowned artist for over forty years. He was a master of many mediums, including, oil, gouache, emulsion, watercolour, acrylic, pastel, marouflage, collage, and engraving. He also sculpted in stone and wood and completed several large murals. In 1985 he completed a work in homage to C E S Hemingway, The Old Man and the Sea, a large sculpture which is sited at Port-en-Bessin in Normandy. From his early twenties he exhibited work throughout France including Paris, Rouen, Caen, Lisieux, Marseilles, Saintes. He also had exhibitions worldwide including Monte-Carlo, London, Frankfurt, the United States (Boston, Houston, Texas and Carmel, California), Tahiti, Japan (Tokyo) and Venezuela (Caracas). His work is held in several public and private collections in France, the US and Mexico.